perplexus.info :: Games : Where is the White King? The position below was achieved in a normal chess game, and there are no other pieces left on the board with the exception of the white King. Where is the white King? How was this position achieved? 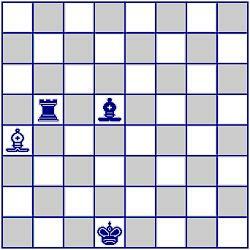 Then, the black bishop checks the white King. The white Pawn advance to defend the check. The black Pawn takes the white Pawn e.p., the white King takes the black Pawn, leaving the black King in check by the white Bishop. So, the white King is in c3.